The new, svelte Lightning connector may require clunky adapters for some hardware – but it’s otherwise not a dealbreaker. Photo (CC-BY-SA) William Hook. 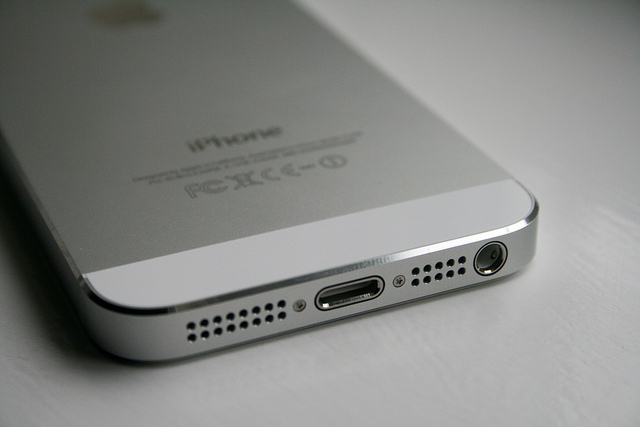 Apple has dropped their own 30-pin standard connector on the iPhone 5 and new iPod touch. In its place is a thinner, lighter, harder-to-plug-the-wrong-way connector called Lightning. So, what does this mean for those of you who use audio accessories for MIDI and recording? Fortunately, not too much. Obviously, it’s a fair bet that we’ll soon see new accessories with the Lightning connector – and, in turn, new iPads that use the same. But you won’t have to throw out old hardware. IK Multimedia (via a press release) and Line 6 have each told CDM their gear should work; IK even goes as far as saying they can verify that their full line is compatible. Apple sells a 30-pin adapter for some hardware. Unfortunately, this adapter does add some bulk, but fortunately, it’s at least reasonably compact. (It doesn’t come with an ungainly cable, for instance.) It works with USB audio, analog audio, and basically all accessories minus analog video accessories. iRig™, iRig MIC, iRig MIC Cast, iRig MIX, iRig STOMP and iRig PRE have been tested and are fully compatible with Apple’s new iPhone 5 without the need of any additional adapter or hardware. In addition to these audio accessories, IK announced that its iKlip MINI universal mic stand adapter for iPhone is also compatible with the new iPhone 5. IK is also promising support for the larger screen real estate on iPhone 5 and the new iPod touch, as well as the iPhone 5’s swifter processor. Line 6, we’d of course love to see MIDI Mobilizer III with a Lightning adapter. In the meantime, these look workable via the adapter, however (if then very, very tall). To me, even if the iPad gets more attention, the iPhone remains a significant device for musicians – and still makes Android and other alternatives pale in comparison. A handheld gadget that can connect to MIDI or help you do field recordings has some huge advantages, enough so that considering the iPod touch – without a contract – looks appealing. We’ll follow the compatibility picture as we hear more.